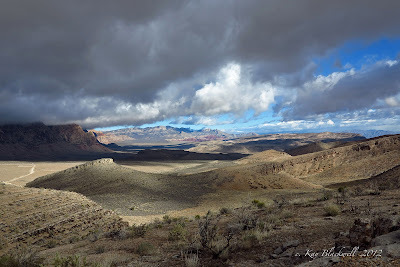 It was a very cold morning in Red Rock Canyon NCA but the rain clouds covered the city, not the conservation area ... when eight hikers started out from the dirt parking area in Calico Basin. We bundled up and began a brisk pace up to Krafft Saddle via 5 Stop Hill. We were warm by the time we crested the saddle and dropped down into Gateway Canyon. The hike was about to begin! Gray Fox Canyon lay up Gateway a little and off to the right. The Gray Cap Scramble is a serious scramble straight up the side of a sandstone mountain through a wonderfully challenging canyon that we have seen a gray fox in before. The route requires a lot of concentration, a respect for exposed areas and a lot of nerve! Tony is seen to the right performing a maneuver that is as difficult as it looks! Below, Mike leads the group across a steep area where there is little between the hiker and his/her sticky soled hiking boots. Mike says, "Just follow the crack ... this tiny little crack in the sandstone ... see it?" 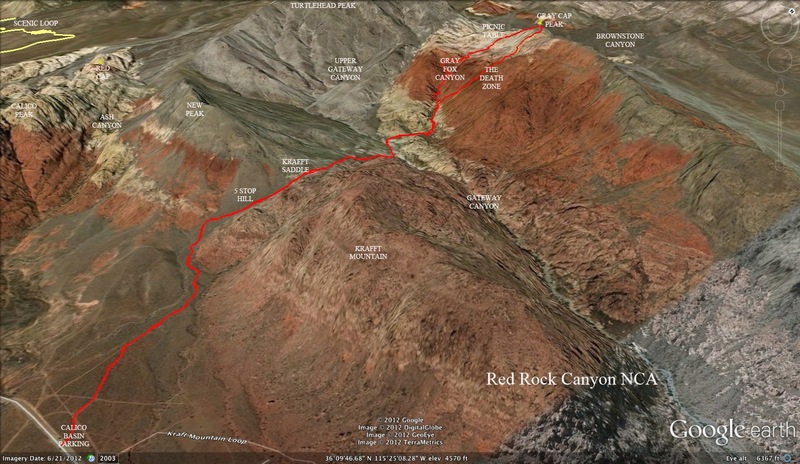 After climbing into the red rock, the group split up here and there while choosing routes that appealed to them. The goal was the huge red monster at the top of the photo to the left that we call rooster rock ... not sure why. The scramble led from cairn to cairn making it easier to know which routes were feasible. Just under Rooster Rock, we had reached the top of Gray Fox Canyon and into the yellow sandstone, we climbed. We found our bearings in relation to the traditional route up Gray Cap and climbed up to the "picnic table." 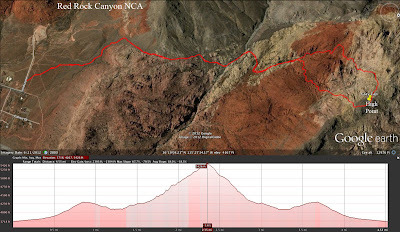 Here, we junctioned with the traditional route and finished the climb to the peak on the trail. Taking a well deserved break on the peak, we watched as the clouds over the escarpment area of Red Rock Canyon began releasing a snow storm on the peaks. Becoming slightly nervous, we decided it was time to start our challenging descent through what we playfully call the "Death Zone!" The descent drops straight down from the peak off of the limestone and into the yellow sandstone. Relying totally on the cairns below us, we descended very carefully and efficiently. We didn't rush. After all, we wanted to live to hike another day! But, we scouted the cairns and were sure with each turn down the precarious route. With Turtlehead Peak to the right of us, the views were beautiful. Even so, there was this small matter of an approaching snow storm. The dramatic weather and colorful rock gave us quite a show when we were able to lift our eyes for a few seconds. 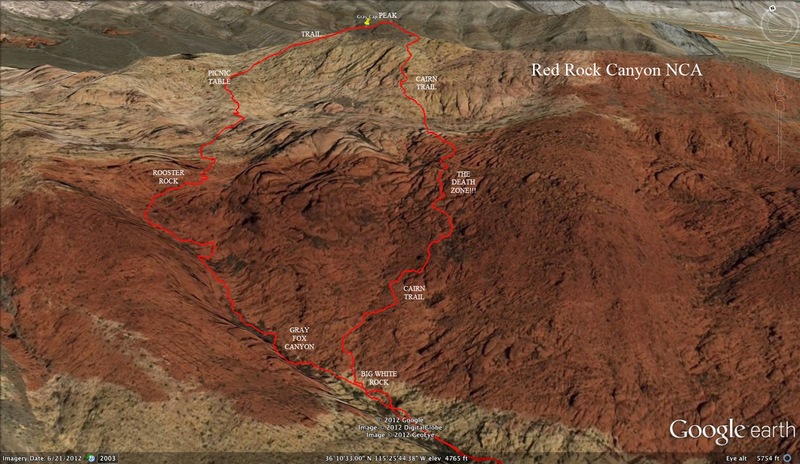 The yellow sandstone gave way to the red rock and the descent scrambles became a little more intense. There were at least two places where gravity was not too friendly as we searched for hand holds and toe holds on our way down. Dropping Down Through the Red Sandstone "Death Zone"
As we neared the ascent route in Gray Fox Canyon, the slope became less steep. Our big white rock as our point of reference was soon looming beside us and we found our way slowly back to Gateway Canyon. The weather had stalled over the escarpment and we were counting our lucky stars! 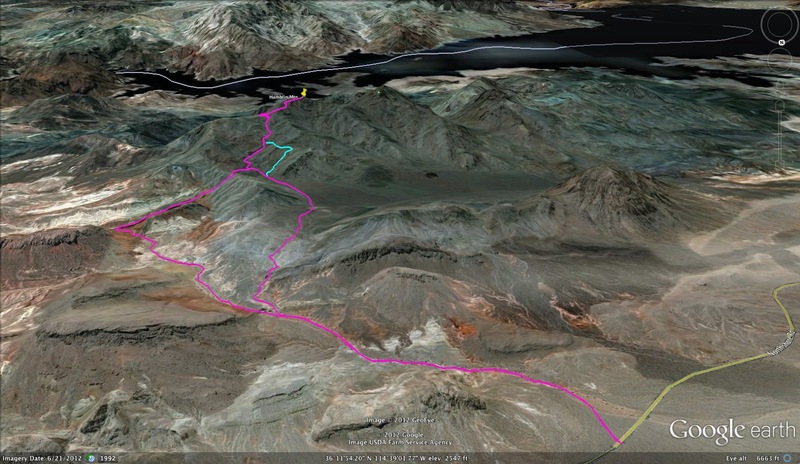 The last part of the hike required a killer ascent back up to Krafft Saddle and a laborious descent back to the cars. 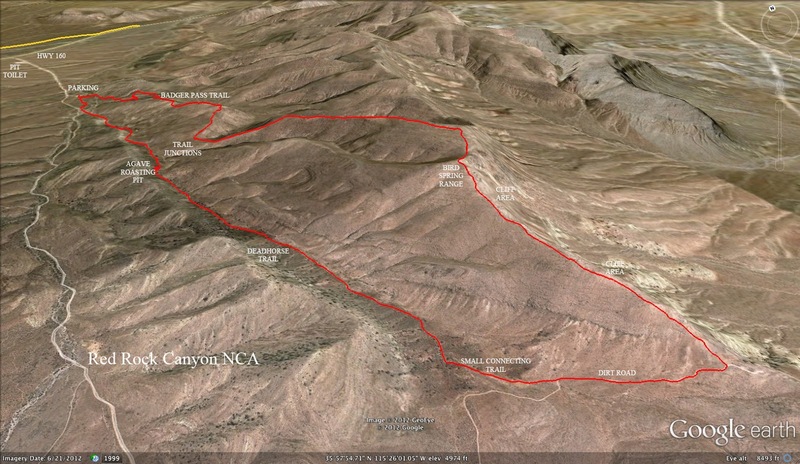 This hike is definitely a great "go to" scramble for any time during the winter if the weather holds out like today. 5 miles; 2250 feet elevation gain; and 5 hours. 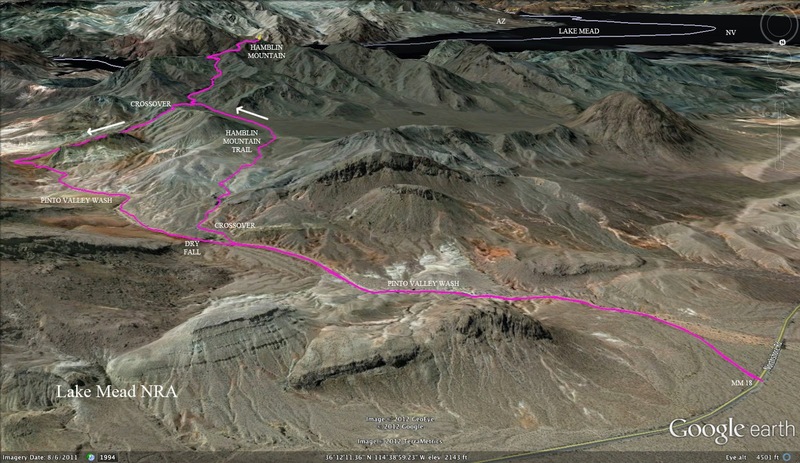 Today's hike to the summit of Hamblin Mountain near Lake Mead's Boulder Basin was attended by ten hikers. Mike OC coordinated today and his preparations of good weather and bighorn sheep came through without a hitch. We drove Northshore Road next to Lake Mead to mile marker 18 and parked in the pull out. The morning chill pushed us to a rapid pace to start the hike up and through Cottonwood Wash, named for the lone cottonwood tree standing at a dry fall and nearby spring. It was here that the route turns off to the right. 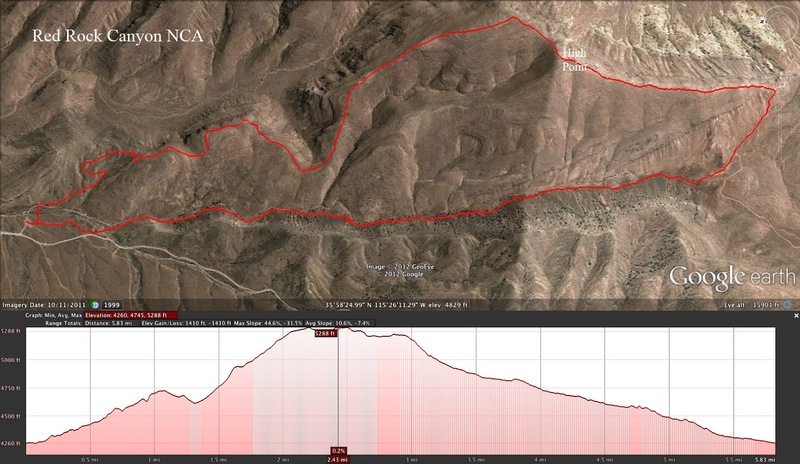 We found the trail and happily hiked up the first climb to an open plateau where we could see Mt. Potosi in the distance. Sometimes You Zig When You Should Have Zagged! We were all talking so intensely that every one of us didn't notice when the line of hikers missed the wash trail heading to the left. Soon we were climbing a very unfamiliar and steep ridge. When we stopped to figure things out, we noticed a small group of male bighorns on a distant slope. Unknowingly, the writer caught a photo of them also having a bit of a zigzagging problem! We made our way back over to the left and found the familiar wash trail. (Some of us had taken advantage of a steep exploratory over the nearby ridge.) 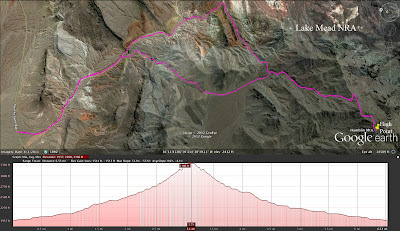 We were now at the beginning of the final climb up through the last wash. Views of Lake Mead began appearing and, after about three more short steep climbs, we found ourselves on the saddle that leads to the peak. On the peak, we each found a nice soft rock and enjoyed the views, of which there are many, while we ate a snack and talked about our surroundings. We had a few hikers that were new to this trail and one hiker who was visiting from Seattle. There was much to talk about! We wrote in the log book and took panoramic photos. The lake was not far below us; Mt. Hamblin West was sticking up nearby; Mt. Charleston and the Las Vegas Strip could be seen far away on this crystal clear day; and closer by, we could see the red rock of the Bowls of Fire. Too soon, we made our way back across the precarious peak section and started hiking back down to that last wash. The morning chill had worn away and there was only a slight breeze. The conversation continued as we dropped down a couple of dry falls and found the trail that turns off to the right over the ridge. This small trail drops the hiker down into the next large wash colored with red mud-like dirt. Ahead of us, we could see the side of Razorback Ridge. Our wash T-bones onto the old Arrowhead Highway at the base of that ridge. Arrowhead Highway was the only road for a period of time that took the adventurous car or buggy traveler from Los Angeles or Las Vegas to Salt Lake City. Can you just imagine? We turned left on the "road" and followed the wash past the western terminus of Razorback Ridge. At the yellow mountain seen in the photo to the left, there is a fork in the wash that follows the northern base of the ridge for a few miles. We continued down the wash encountering a twenty foot dry fall at that cottonwood tree mentioned before. This is where the trail route finishes the intermediary loop and we begin hiking out Cottonwood Wash to the highway and our cars. The hike today, including our little accidental excursion was seven miles with around 1500 gross gain of elevation feet. A good workout, to be sure. We found the head and part of the spine of a bighorn sheep who had recently been someone's dinner. His teeth were exceedingly interesting. There was still some hide adhering to the bone. The Circle of Life, etc. 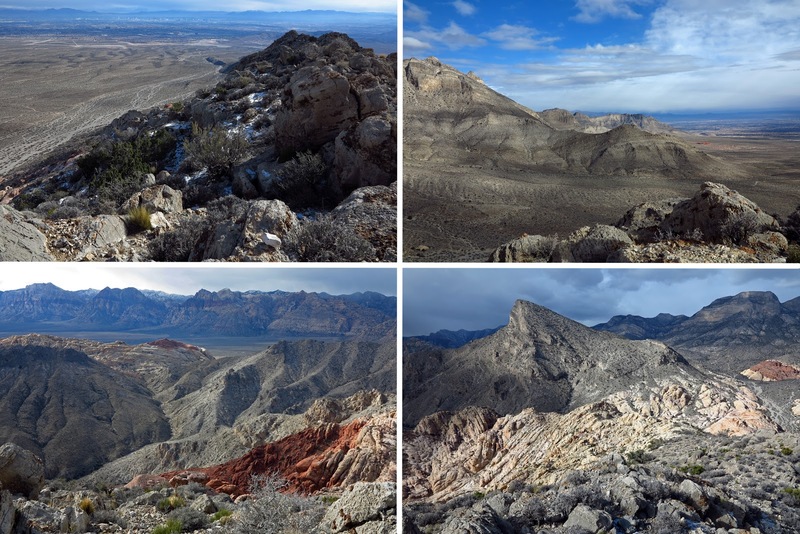 Sixteen hikers arrived on this windy and cold Christmas Eve morning to do the Bird Spring Range hike. We drove up Highway 160 through a light rain shower ready to get wet on the hike. Three and a half hours later, the clouds were a lot less threatening, there was a light dusting of snow on nearby Mt. Potosi and not a single drop of rain touched our jackets. We did, however, encounter some moderate winds. 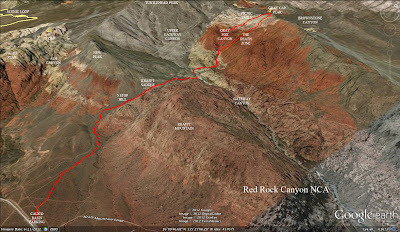 The hike began at the Badger Pass trailhead found south of the escarpment and Cottonwood Valley. We brought along the geologist in residence of Red Rock Canyon NCA, Nick Saines (seen to the left), who was interested in becoming more familiar with the Bird Spring Range area. In turn, he gave us some very interesting information on the fossils we found on the ridge. 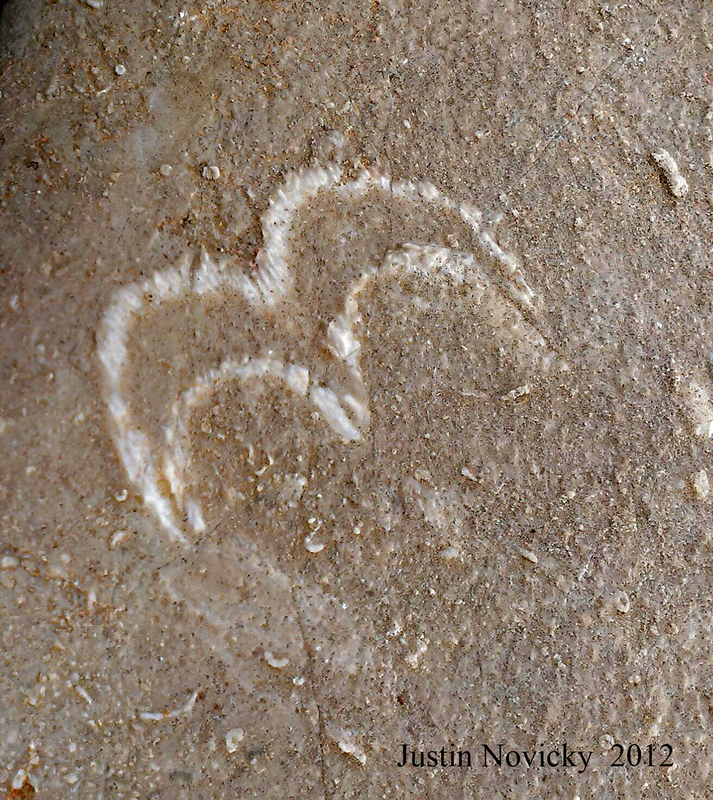 1) The fossils found here and in the North Blue Diamond Hills are from the Permian Kaibab Era, 275 million years ago. 2) This era was ended by the extinction of 90% of life on Earth due to a rise in temperature of only 10 degrees Centigrade. 3) These fossils were made from the death of this life at this time. 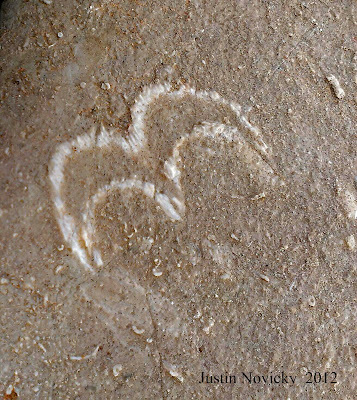 4) The next era, the Triassic, began the evolution of life all over again ... dinosaurs, etc. ... so there was a long period of time when there was no life to leave fossils. That's why so much of the Earth does not contain apparent fossils. It is all very fascinating and Nick can say it so much better. 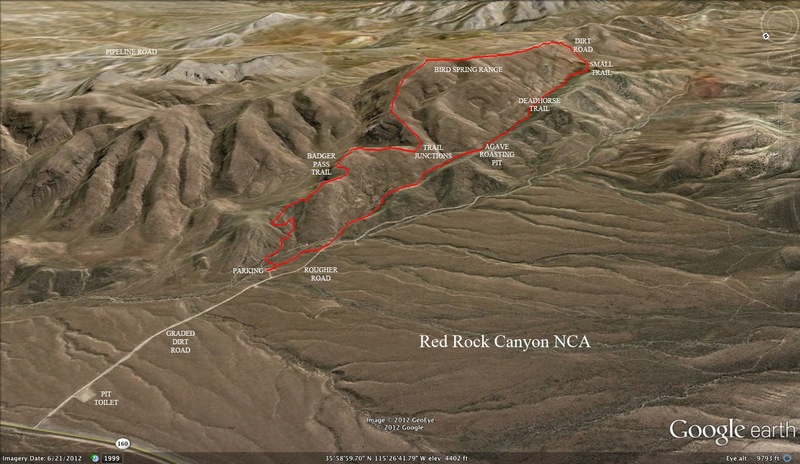 He leads interpretive hikes for Red Rock Canyon and the schedule for these can be found on their website. The photo to the left shows a brachiopod fossil in chert. It was so nice to have someone with us that had so many answers to our endless questions about what we were encountering up on the ridge. Thanks, Nick. At the end of the first portion of the ridge, we carefully hiked down to the dirt road that approaches this site. From here, we hiked down the road toward Deadhorse Trail, the trail that would return us to our cars. This is a pretty trail that leads next to the drainage where there is much greenery in the form of junipers and joshua trees. In the photo to the left, Don showed us where there is an ancient agave roasting pit next to the trail. 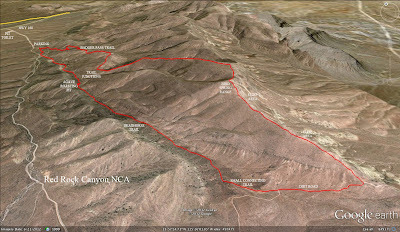 Today's hike was 6 miles with 1300 feet of gross elevation gain. Merry Christmas everyone!